When you get a craving for a peanut butter and banana sandwich, go ahead and indulge. If you choose your bread wisely, this sandwich is a healthy choice for breakfast or lunch. 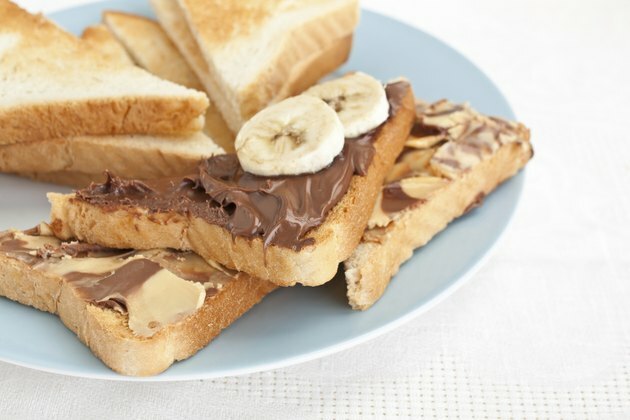 A peanut butter and banana sandwich provides healthy unsaturated fats, protein, fiber and complex carbs. Its combination of protein and fiber help you feel full, while the carbs give you sustained energy. A peanut butter and banana sandwich made with half of a medium banana, 2 tablespoons of smooth peanut butter, and two slices of whole-wheat bread has 402 nutrient-dense calories, 17 grams of protein and 7 grams of fiber. This means you'll get at least one-third of your recommended dietary allowance for protein. Since women need 25 grams of fiber daily, and men should consume 38 grams, the total fiber in this sandwich provides 28 percent of women's daily intake and 18 percent of mens. You'll also get 47 grams of total carbohydrates, which consists primarily of starches, or complex carbs. Peanut butter is high in fat, with 16 grams in 2 tablespoons, but about 80 percent of the total fat consists of unsaturated fats. These are the good, or healthy, fats that help reduce your risk of developing cardiovascular disease because they lower cholesterol and may ease inflammation, according to the Harvard School of Public Health. 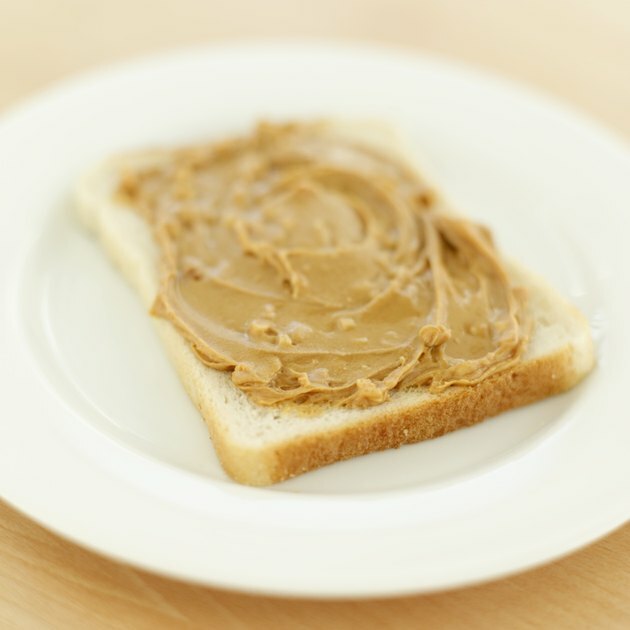 The peanut butter contributes about half of the sandwich's total protein and calories, 1/3 of the total fiber, and it's a good source of antioxidant vitamin E. Watch for the amount of sodium. 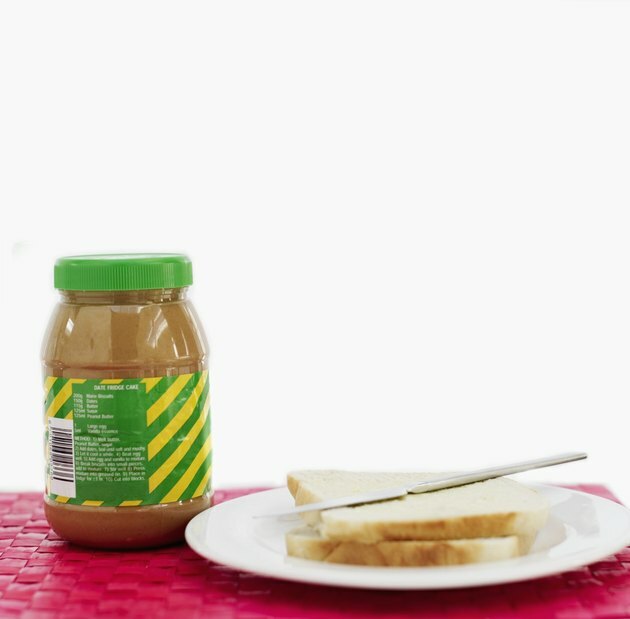 Generic peanut butter has 147 milligrams of sodium, according to the USDA Nutrient Database. You can reduce that to about 5 milligrams of sodium with salt-free brands. Use whole-grain bread to make your peanut butter and banana sandwich because whole-grain products retain all of the natural fiber, vitamins and minerals. When grains are processed to make white flour, the bran is removed and the bran contains most of the fiber. Many processed breads are fortified, so they regain vitamins and minerals, but fiber is not usually added back, unless it's a special high-fiber brand of bread. 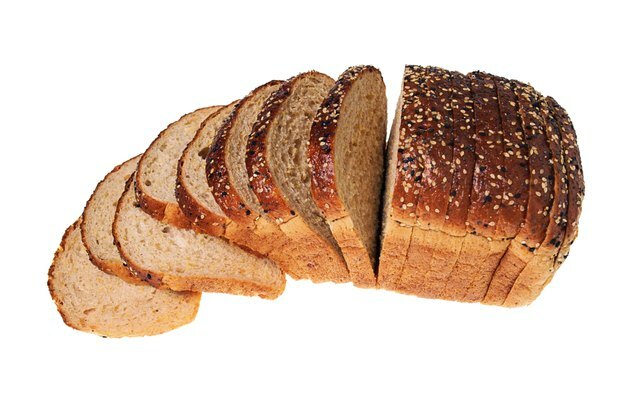 Two slices of whole-grain bread contribute half of the sandwich's total fiber. Soluble fiber helps lower your cholesterol and prevents sharp spikes in your blood sugar. It also absorbs water, which makes you feel full. Insoluble fiber, or roughage, helps prevent constipation. Bananas go well with peanut butter, and they're a healthier choice than jam, which consists of nothing but sugar. 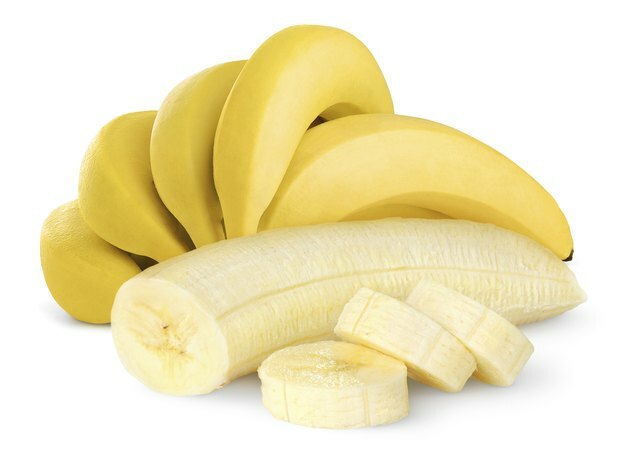 One-half of a medium banana contributes about 20 percent of the sandwich's total fiber and 1/3 of the total carbs. This portion of banana is fat free and only has 53 of the total calories. You'll gain 17 percent of the recommended dietary allowance for vitamin B-6 from half of a banana. It also provides some potassium and vitamin C.
Harvard School of Public Health: Food Pyramids: What Should You Really Eat? How Many Calories in a Slice of Pepperoni Pizza? Are Bagels Better for Losing Weight Than Wheat Bread? Are Pretzels Healthy to Eat?